When teaching fractions, decimals, & percents, I try to make it fun because the students tend to struggle with converting between the three. By bringing in Skittles, the students will be able to complete the activity in an enjoyable way! I did this activity a few years ago and it was a great success! I bought some fun size packets of Skittles and the students are to open the packet of skittles and lay all of the skittles in front of them. They have to find out how many skittles they have and how many skittles of each color. Following this, the students have to find the fraction, decimal, and percent version for each color. In addition to this, I added a few questions into the activity, as well as a summary. 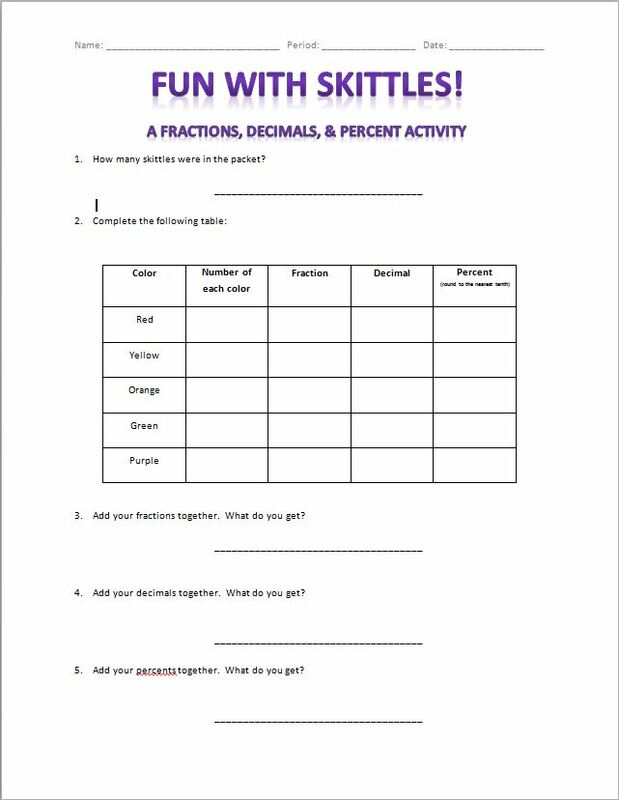 I plan on using this activity this week, so we will see how it goes! You can download this activity HERE.